Things are changing in the Gal Foodie kitchen. And actually, the kitchen is literally what is changing. The whole idea of change is bred into us Mainer’s as something to be avoided. “If it ain’t broke, don’t fix it,” as they say. Well, things here are “broke” and I’m about to fix it. And wow, has it gotten a little stressful around here. Us islanders thrive on rumors, and this one is true. We’re moving. It is bittersweet to leave Mount Desert Island, and a lot of tears have already been shed for the lifestyle, place and people I’m about to give up. It has been a challenge living here – a hard life, surrounded by a beauty that can’t be denied. It’s a place that captures your heart… if you can survive the winter, of course. There’s so much to look forward to where we’re going. Farmer’s Markets, and restaurants, and specialty food shops, fishmongers and grocery stores (!!). Family and friends and the familiarity of a hometown. And at the very least, a burger and a beer within a reasonable distance! (That’s not even an option here 9 months out of the year!). Ben and I are excited about the change, and overwhelmed by the task of making it happen. So, to help relieve the anxiety, I looked no further this week than to the comfort of a food that hasn’t changed in my life in 36 years. Nana’s Brownies. My mother is famous for knowing exactly when a giant pan of these needs to be made. We kids always called it “brownie brainwaves.” We would come home from some crazy adventure, and mom would have the brownies already done and cooling on the counter. How did she know? I’m pretty sure my Nana had the same talent, and I’m pretty sure this recipe was created to ease the heart and soul in times of change. 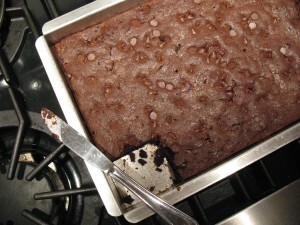 What better way to take your mind off the moment than falling head over heels into a pan of warm brownies? 2. In a separate bowl, beat eggs and add sugar and vanilla. Beat until smooth. 5. Grease a 9×13 pan and bake at 350 for about 35 minutes. Do not over bake. 6. Sit down, relax, enjoy the moment as you bite into the warm, gooey yummy that is… Nana’s Brownies. As my Nana said to my mother, and my mother to me, “This too, shall pass.” And so it will, even if I have to bake brownies every day until I’m in my new kitchen, starting my new life on the mainland. Pass the milk and the packing tape, please. This entry was posted in Uncategorized and tagged anxiety, brownie, brownies, chocolate, chocolate chips, dessert, island cooking, island living, island recipes, Kittery, MDI, mount desert island, moving, nestle, nuts, recipe, stress, walnut, walnuts on May 28, 2009 by galfoodie.